It is that time of year again where we at Eurocircuits would like to thank you for your support in 2017 and making this another successful year. We would like to inform you that we will have a production rest during this festive season to let our hard working colleagues spend time with their families. Our factories will be closed for production from 25th December until 1st January 2018. Production will recommence on 2nd January and the last shipment for 2017 will be 21st December 2017. We wish you and your families a very Merry Christmas and a Prosperous New Year and look forward to working with you again in 2018.
eC-reflow-mate V4 – why not include it in your Christmas shopping ? Most electronics engineers would be very pleased to have the new eC-reflow-mate V4, the successor to our very popular Bench top reflow oven, operating in their lab. We have redesigned the eC-reflow-mate and the eC-reflow-pilot software based on feedback from our customers to provide the most professional Bench-top reflow oven on the market. Why not grant yourself this nice piece of equipment and include it in your Christmas shopping? The new eC-reflow-mate-V4 is faster than the previous version and includes the eC-hood in the package. It’s two layered drawer allows fast after reflow opening of the oven door for faster cooling down of board and components. 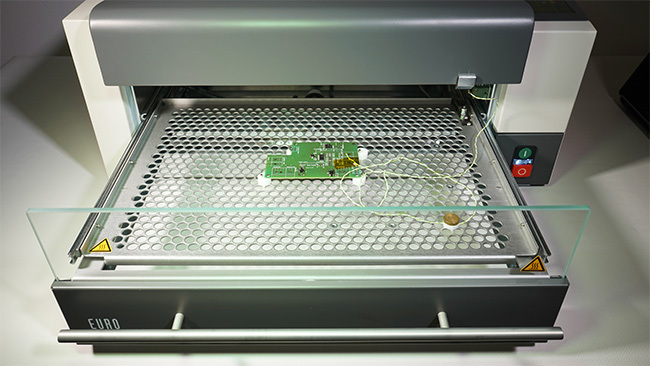 The upper drawer which supports the board, does not move while opening the door thus keeping the components stable while the temperature is still over the reflow point. A new eC-reflow-pilot software allows easier manipulations of the oven software and solder curves. At Eurocircuits we are continuously working hard to bring Services, tools and equipment to the Electronics design market to provide for the prototype and small series electronics market. Services to offer great quality PCBs and Solder Paste Stencils. Tools in the form of PCB Visualizer to provide automated verification, editing and quotations to allow the shortest possible concept to market solution. Equipment to empower designers to produce professional quality assemblies in Prototype and small series quantities. You can find the eC-reflow-mate in your Off-The-Shelf section of your Eurocircuits account, just select add to basket and proceed to checkout, it is that easy. Posted on behalf of TE connectivity, Den Bosch, The Netherlands. Industrial IoT developments ask for smaller and more reliable connectors. Latency requirements will call for higher connection reliability in environmentally severe industrial applications with vibrations. Even for industrial IP20 applications the default connector of choice is typically the RJ45, which is originally not designed for this type of use. This white paper compares Ethernet connector systems on connection reliability in industrial IP20 applications. 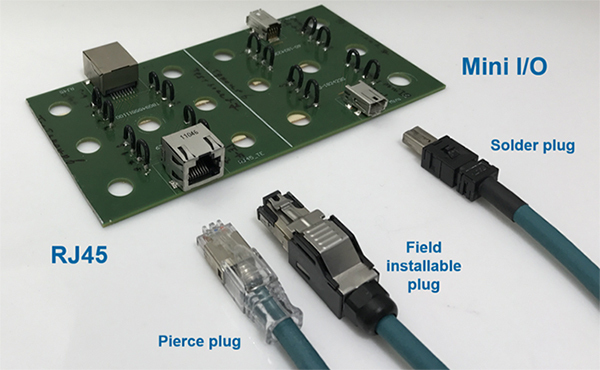 Specific tests sequences have been used to measure performance of 2 Ethernet connector systems.